Intelligent and affectionate dogs, shelties live approximately 14 to 16 years when they are well taken care of and healthy. All dogs should have regular yearly check-ups with a veterinarian to screen for any potential health problems. Your lovingly cared for sheltie can reach the middle of his second decade. In the past, the average lifespan for all dogs was lower than today's breed averages. With advances in veterinary research, newer medications, improved diets and increased veterinary care, all dog breeds live longer now than ever before. 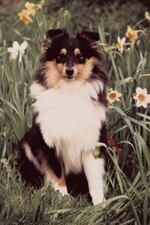 The lifespan of shelties, as Shetland sheepdogs are lovingly called, used to be 12 to 14 years. Certain health issues affect Shetland sheepdogs, considered a healthy breed overall. Hip dysplasia, Legg-Calve-Perthes disease, von Willebrand disease, hypothyroidism, congestive heart failure and epilepsy are the top causes for concern with shelties. Additionally, shelties are known for having skin problems from allergies and autoimmune diseases, and eye defects such as cataracts, collie eye anomaly and progressive retinal atrophy. Veterinarians recommend having Shetland sheepdogs have DNA and thyroid tests as well as eye and hip tests. When Is a Sheltie Considered Older? For small dogs such as shelties, 10 years in dog years is equivalent to a 60-year-old person. A 15-year-old small dog equates to an 80-year-old human. Technically, cats and small dogs are considered geriatric at the age of 7, notes the American Veterinary Medical Association. Some health problems that can develop in all geriatric pets include cancer, heart disease, kidney and urinary tract disease, liver disease and diabetes. Consult your veterinarian with any concerns you may have about your older sheltie. As shelties age, their needs change. Older dogs develop many of the same problems that older people do, so they should be examined by a veterinarian twice a year to detect potential health problems early. They also need regular exercise to help them stay mobile and healthy, and they might need a change in diet. It is important to keep senior dogs comfortable. Contact your veterinarian to schedule semi-annual exams and to discuss any changes in lifestyle, food or medications that may be necessary for your older sheltie.